THREE CHOICES! Architecturally stunning - ocean view villa, and/or two casitas. 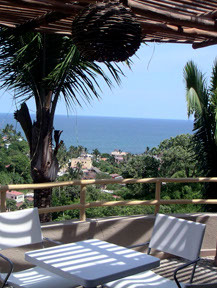 Set on a close-in hilltop, Villa Cielito and Casita Cielito have stunning ocean, town and valley views but are located away from the noise - just three or four blocks from the plaza and beach. Location, location, location - you won’t need a car, and you won’t need to walk far to get to the town’s center or beach. Because of the hilltop location, there is a constant ocean breeze into all rooms. Casita Libertad, located near the bottom of the lot on Calle Libertad, is also a newly constructed “floating” house with a private roof terrace under a palapa. JUST ABOUT PERFECT! - AND REASONABLY PRICED!